Scorpion's breakout machines can perform both makeup and breakout operations with ease. 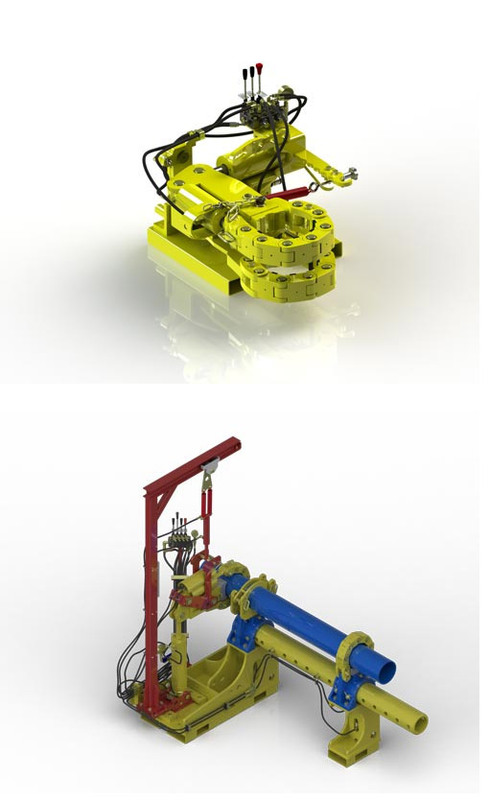 All of Scorpion's machines feature powerful hydraulic cylinders that can produce up to 250,000 ft-lbs of torque (on the largest model). Each machine is designed to handle a wide range of OD (outer diameter) sizes, from 1 inch to over 36 inches. Most of our breakout machines can fit on the back of a pick up truck for easy transport, and can be moved using built-in forklift skids, lifting eyes, and wheels (depending on the model). Our breakout units have low power requirements (2 GPM) and can be powered by one of our portable power packs (electric, diesel, gasoline, and air/pneumatic options), or can be powered by rig hydraulics. We offer a wide range of portable units that can operate in any position, as well as a selection of horizontal bench units that feature adjustable arm spacing of up to 20ft to prevent gripping sensitive areas on tools. Scorpion has been in business for over 30 years and specializes in breakout machines. We offer over 20 configurations of makeup and breakout machines, and frequently customize our machines to fit specific applications. Get a grip on your tools and choose a Scorpion breakout machine - visit our shop and demo one today.